For most of his presidency, the unemployment rate hung like a millstone around President Obama's neck. But today's jobs figures, showing that unemployment last month fell below 8 percent for the first time in 43 months, marked a symbolic breakthrough. Nevertheless, the Republican Party today stressed that a 7.8 percent unemployment rate is hardly something to brag about. "This is not what a real recovery looks like," Mitt Romney said in a statement. The Labor Department said Friday that employers added 114,000 jobs in September. The economy also created 86,000 more jobs in July and August than first estimated. Still, the Republican candidate noted that there were fewer jobs created in September than in August, and fewer jobs in August than in July. And while manufacturing jobs have been on the rise since the spring of 2010, Romney noted that overall, "we've lost over 600,000 manufacturing jobs since President Obama took office." "The choice in this election is clear. Under President Obama, we'll get another four years like the last four years," he said. "If I'm elected, we will have a real recovery with pro-growth policies that will create 12 million new jobs and rising incomes for everyone." Mr. Obama today at a campaign stop in Virginia acknowledged that "every month reminds us we've still got too many of our friends and neighbors who are looking for work." At the same time, he said, "Today's news is certainly not an excuse to try to talk down the economy to score a few political points." "This is a reminder this country has come too far to turn back now," he said. "I have seen too much pain... to let this country get hit with another round of top-down economics." 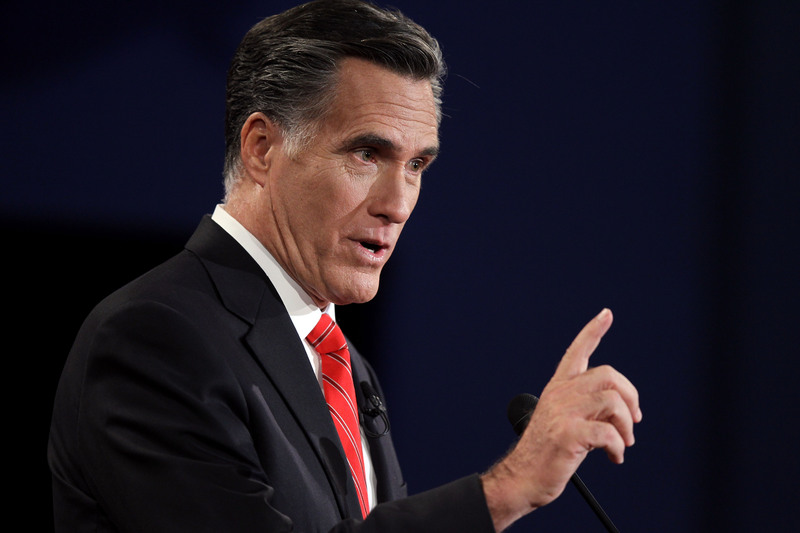 Romney and other Republicans have repeatedly stressed the number of months that unemployment remained above 8 percent. Most recently, Romney said in his closing remarks during Wednesday's presidential debate, "There's no question in my mind that if the president were to be reelected you'll continue to see a middle-class squeeze with incomes going down and prices going up... We've had 43 straight months with unemployment above 8 percent. If I'm president I will create -- help create 12 million new jobs in this country with rising incomes." This latest jobs report blunts that rhetorical strike. Still, as Republicans made clear today, there are plenty of other depressing economic statistics they can employ to demonstrate the president's shortcomings. "After four years of spending, taxing, and red tape, millions of Americans remain jobless, underemployed, or have simply given up looking for work," House Speaker John Boehner said in a statement. "Wages are stagnant. Gas prices and health care costs are up. And economic growth is even lower today than in 2010 when the president said the 'fiscal cliff' tax hikes he now demands would mean 'smaller paychecks' and 'fewer jobs.'" House Majority Leader Eric Cantor called the unemployment report "encouraging news," but like Romney said, "it simply isn't good enough. 7.8 percent unemployment should not be cause for celebration. Millions have given up looking for a job, and left the workforce. The workforce participation rate hasn't been this low since Jimmy Carter was President. America needs a new direction." The White House reacted to the jobs report with measured optimism, acknowledging that the economic environment is far from ideal. "While there is more work that remains to be done, today's employment report provides further evidence that the U.S. economy is continuing to heal from the wounds inflicted by the worst downturn since the Great Depression," Alan Krueger, chairman of the Council of Economic Advisers, wrote in a White House blog post. "It is critical that we continue the policies that are building an economy that works for the middle class as we dig our way out of the deep hole that was caused by the severe recession that began in December 2007." White House senior adviser David Plouffe said on MSNBC, "We continue to recover from a horrible recession."